Arancini: Arancini or arancine are fried rice balls coated with breadcrumbs, said to have originated in Sicily in the 10th century. Arancini are usually filled with ragù (meat sauce), tomato sauce, mozzarella, and/or peas. There are a number of local variants that differ in fillings and shape. 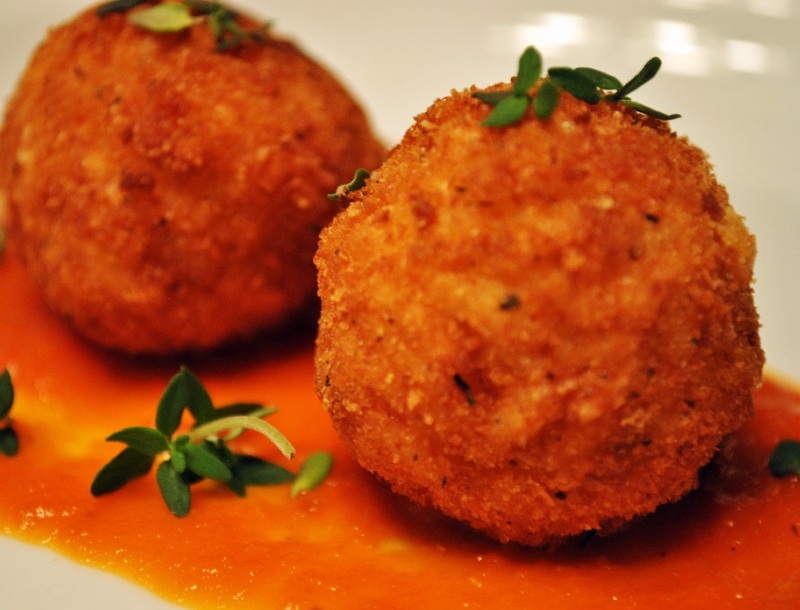 The name derives from the food’s shape and color, which is reminiscent of an orange (the Italian word for orange is arancia, and arancina means “little orange”). Note: Though arancini can be made with many types of rice. The best rice for arancini is actually sushi rice (despite how unauthentic ally Italian that may be!) because it is much more glutinous so it’s easy to work with. Place a large heavy-bottomed pot over medium heat. Add enough vegetable oil to rise 4 inches in the pot. Combine the rice, Parmesan and 1 egg in a medium bowl. Form each arancini by taking a portion of the mixture, squeezing it firmly and stuffing one cube of mozzarella inside each ball. Repeat this process to form 8 arancini balls. Whisk together the remaining 2 eggs, to make egg wash.
Dip each arancini in the egg wash and then in the breadcrumbs, shaking off any excess. Once the oil reaches around 190ºC, add 2 or 3 of the breaded arancini to the pot. Fry them until golden brown and cooked throughout. Use a slotted spoon to remove the fried arancini from the pot. Transfer them to a paper towel-lined plate. Immediately sprinkle salt on the arancini. Repeat the frying process with the remaining arancini.